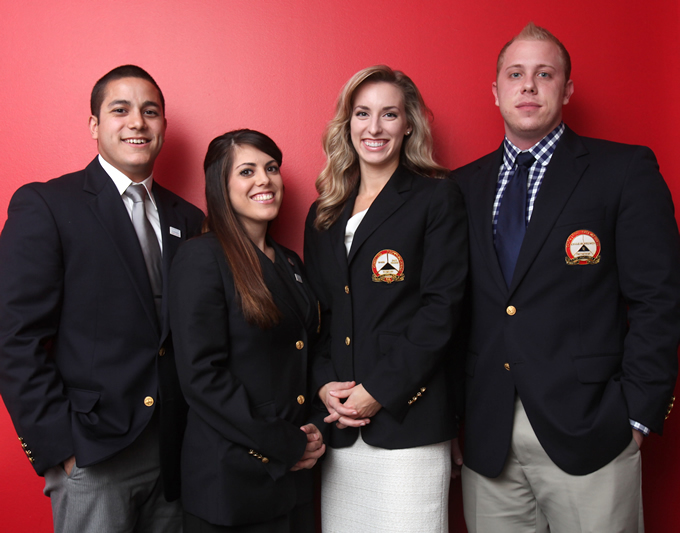 Program for Excellence in Selling students (from left) Daniel Rodriguez, Grace Moceri, Rebekah Elliott and Alex Lyons impressed judges at a national State Farm competition. 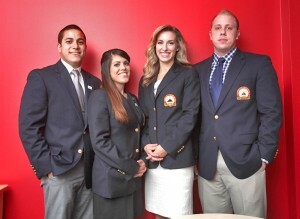 Students from the Program for Excellence in Selling at the University of Houston C. T. Bauer College of Business again proved their sales savvy at a national level, taking home accolades at the first-ever State Farm Marketing and Sales Competition in November. The UH Bauer team, consisting of competing members Grace Moceri and Daniel Rodriguez and alternates Rebekah Elliott and Alex Lyons, placed second overall, with Moceri taking a first-place victory for the Sales Role Play portion of the competition. Hosted by the University of Central Missouri, Bauer students went head-to-head with students from major colleges and universities across the country in a day-long event where competitors battled in mock sales situations, selling auto insurance policies to young adult customers. “Competitions are important to Bauer and the Program because they give our students a chance to compete with other schools and show just how good our program is,” said Randy Webb, an executive professor and Director of Undergraduate Studies in PES. “This competition particularly enhances our strategic partnership with State Farm, giving the students an opportunity to not only further understand the sales process but also create marketing plans focused on the young adult market,” he added. Moceri helped to distinguish the college and the program on an individual level. Each student had to prepare a written marketing portfolio and provide analysis and ideas for marketing and selling auto insurance to young drivers and then compete in video-taped sales presentations. An independent panel then judged the portfolio and presentations, giving the students an overall score. Coached by clinical professor Amy Vandaveer, the students prepared for the competition by familiarizing themselves with State Farm, researching, and collaborating as a team to develop their marketing strategies and selling processes. Along the way, the students learned how to approach a specific target market, work as a team, and develop valuable communication skills. With all the preparation, the students were able to once again prove why the Program for Excellence in Selling is consistently ranked nationally every year.